Isagenix Coffee with Coconut Oil, Green Tea Extract and Trace Minerals, 100 percent “fair trade” arabica beans from Mexico, Central, and South America. The arabica beans are never touched by human hands during the roasting process. 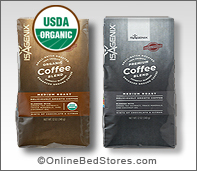 Isagenix Coffee is slow-roasted ground coffee blended with coconut oil and green tea extract. New scientific research has shown that coffee supports brain health, heart health, weight management, and overall wellness. ￼￼￼￼Isagenix Coffee is a fairly traded blend of 100 percent arabica coffee beans grown at high altitudes. The beans are selected by a licensed coffee grader, slow roasted in small batches, and expertly blended by a certified roast master. To keep the perfect flavor, the beans are finished using cool grind technology, giving you premium, fresh ground coffee to help start your mornings right. 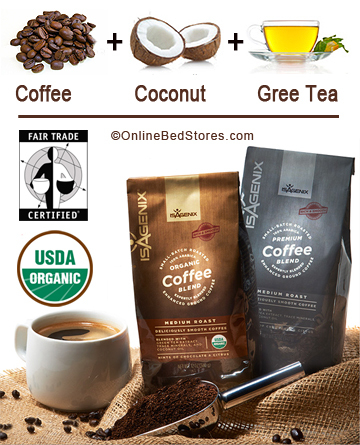 Isagenix Coconut Oil Ground Coffee is Available in Premium “Non Organic” or “USDA Certified Organic” Blends. INGREDIENTS: Arabica coffee, coconut oil, seaweed-derived calcium and magnesium (with trace minerals), green tea leaf extract. * Mycotoxin – a toxic substance produced by a fungus and especially a mold. * Aflatoxi – any of several carcinogenic mycotoxins that are produced especially in stored agricultural crops.